I’d never heard this term before, but Nicholson puts it in quotes, suggesting it is some kind of workman’s slang, or at least an uncommon term. In describing cloth case binding, and how to use a plough, he writes. “If the volumes are small, a number may be cut at the same time. This mode of cutting is called ‘steamboating'”. This was originally written in 1856. Perhaps it is emblematic of the 19th century preoccupation with steam power in general, and how a machine can influence even the terminology of hand work. A 19th century bookbinder ploughing a book. Original size roughly 1 x 1 inch, which may account for some of the missing lines on the press and the tub. 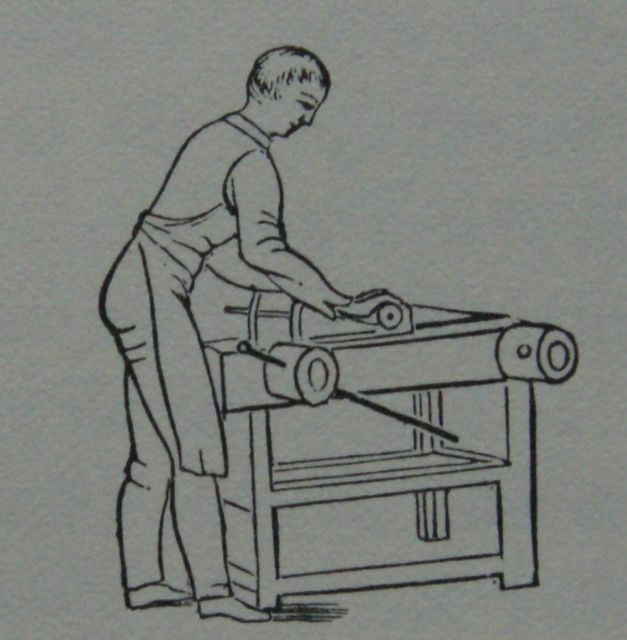 Even in this small illustration, the downward pressure of the binder is evident, which is necessary to achieve a straight cut. Also, his left foot appears to be slightly raised, also implying heavy pressure on the plough, and a speedy rocking motion with the body. Illustration from: Nicholson, James B. A Manual of the Art of Bookbinding: Containing full Instructions in the Different Branches of Forwarding, Gilding, and Finishing. Also, The Art of Marbling Book-Edges and Paper. The Whole Designed for the Practical Workman, the Amateur, and the Book-Collector. Philadelphia: Henry Carey Baird, 1874.
yet uncovered, or out of boards. –Knight. I took a look at my copy of Nicholson (1902) just to see it ‘in the flesh’. And couldn’t figure out why. This one will take some investigation. Very interesting since it specifically refers to ‘out of boards’ work- cloth case. Here is a link to the google scan of Knight’s American Mechanical Dictionary, 1876. steam-boating. Could it just be the speed of working that emulated the infernal steam engine? Somewhat relatedly, Knight defines ‘rolling’ (p. 1964)as “The process of flattening the pack of gathered signatures by hammering or passing through the rolling-press.” The more recent machine has caused the previous hand action to be renamed. Anyway, I will try some steam-boating the next time I teach my historic cloth case class! Don’t forget to dress like Mark Twain when steamboating. I seem to remember the phrase “steamboating” to refer to the practice of pulling a fast one on an unsuspecting rube. Given that definition, could this refer to the practice of trimming a stack of books instead of a single book at a time, possibly with less accuracy yet charging the customer for a one-off job? I really doubt it. A well tuned plough can cut easily cut a three inch thick textblock, or six 1/2″ blocks. Many operations in bookbinding are/ were done en mass.